DCAC adviser Jennifer Ferguson meets with a student. Kimberly Wong was just looking for a quick bit of advice on scholarship applications — and maybe a quiet place to eat her lunch — when she walked into Oakland High’s center for college and career counseling last fall. What she got instead was a mentor, Thalia Rodriguez, who has been with her through every step of the college application process and pushed her to aim high. “She convinced me not to settle for less, and really helped me to believe in myself,” said Wong, who was accepted at most of the schools she applied to. She plans to head to Cal in the fall. The two worked together to research colleges, complete forms for financial aid, hone Wong’s applications and help her zero in on a subject for her personal statement. It’s the kind of one-on-one guidance that some families pay big bucks to get from a private tutor — an impossibility for Wong, whose parents work in a donut shop and struggle to find money for basic school supplies and shoes. Rodriguez, a recent UC Santa Cruz graduate, was once in the same boat. 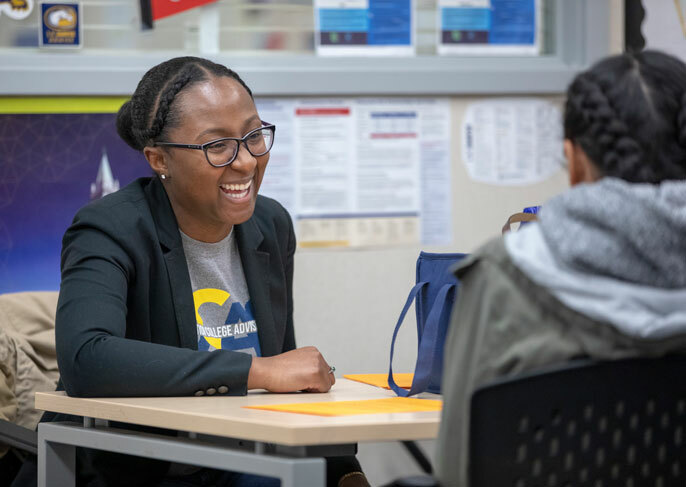 Today, she’s part of UC Berkeley’s Destination College Advising Corps, an innovative program that puts recent graduates to work as full-time college advisers and mentors to students in underresourced high schools and community colleges. Mentors were themselves first-generation, low-income and underrepresented students, and many return to work in the communities where they grew up. Rodriguez, for example, attended an Oakland high school just down the street. DCAC adviser Thalia Rodriguez has helped Kimberly Wong (left) aim high in applying to colleges. Many eligible, high performing students miss out on college, or aim too low, just because they don’t know that financial aid is available to help cover their costs or are unaware of key deadlines. The problem is especially acute for students who don’t have a family member who can help them figure it out. High school guidance counselors — whose numbers have shrunk amid budget cuts — are often managing a caseload of 800 or more students, and focus their energies on keeping kids from dropping out. They often have little bandwidth for shepherding students through the college process. That's where Destination College Advising Corps comes in. The program provides recent college graduates with a two-year fellowship that gives them valuable career experience, while providing high school students with a peer they can turn to for everything from practical advice to insights into college social life. Started in 2007 with just two advisers, Destination College Advising Corps has now grown to 48 advisers at 39 schools throughout the Bay Area. In participating schools, 75 percent of seniors have the opportunity to meet with a DCAC advisor, and 60 percent apply to college. That’s a 25 percent increase in the number of students pursuing higher education. UC is now looking to build on those successes by expanding the program across the state. Ferguson and other advisers are on-site five days a week to help students who drop in for advice. Advisers are on site five days a week in the schools they work. They work with groups of students to close achievement gaps, but they also make themselves available on a walk-in basis to any student who happens to drop by. It is a level of service otherwise hard to come by in resource-strapped public schools — and brings a college-going message to students who might otherwise not have considered extending their education past high school. That was the case for Michelle Brown, an Oakland High senior who wasn’t really interested in school until she began working with DCAC adviser Jennifer Ferguson. Brown is now getting A’s in most of her classes, and has set her sights on community college and possibly a four-year degree. Mentors encourage students to set their sights higher, in part by encouraging them to see that they already have leadership experience and work credentials: summer jobs, cooking for the family, taking care of younger siblings — it all counts. “UC Berkeley is just 15 minutes away, but a lot of our students can’t imagine themselves ever going there,” said Chaney Saephan, an Oakland High grad who earned her degree from UC Berkeley. She is now back at her old high school supervising the Destination College Advising Corps program. Rodriguez and Ferguson have returned to the communities they grew up in to get more students to college. This fall, UC Merced launched its own version of the advising program, called College Advising Corps, and other campuses are looking to follow suit. UC Merced’s program puts recent graduates in eight schools in the Central Valley, an area with some of the lowest college-going rates in California. “Families relate to me. They see that if I did, they can do it too,” said Christina Gonzalez, who graduated from UC Merced last spring with a degree in human biology, and is among the inaugural cohort of Advising Corps fellows. Gonzalez began her work with College Advising Corps in October — just a few weeks before college applications were due — and saw right away how much her services were needed. A transfer student from Merced College, Gonzalez helps students explore all the paths they can follow to higher education. She also speaks Spanish, which helps her reach not only students but parents with information on the value of higher education. “I want to instill a college-going culture at this school. I see a lot of counselors are overworked and they’re not going to be able to reach every student. That’s where we step in,” she said.